Enterprise Investment Scheme – a worthwhile opportunity? The Enterprise Investment Scheme (EIS) is now over 20 years old. This is quite a remarkable achievement for a tax break. A change in government often results in the demise of one tax break and the invention of a ‘new and better’ tax relief. There have been amendments to EIS over the years but it still attempts to help smaller trading companies raise finance by offering a range of tax reliefs to investors who purchase new full-risk ordinary shares in those companies. 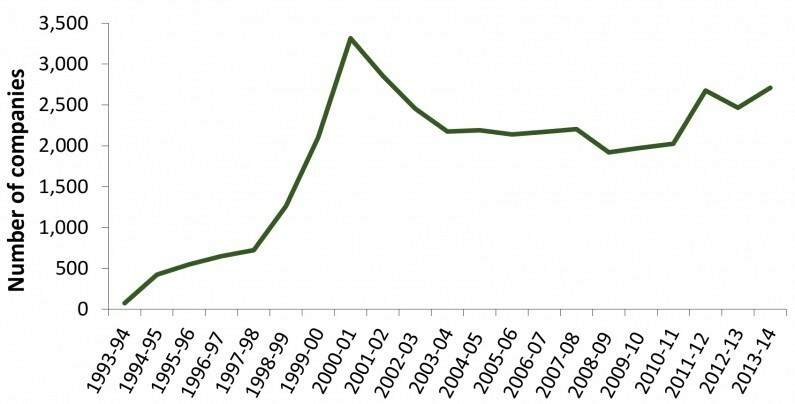 The chart shows the number of companies raising funds in the first 20 years of the scheme. The peak in 2000 reflects the dot-com boom. In 2013/14, 2,710 companies raised a total of £1,457 million of funds under the EIS. What are the tax breaks? CGT exemption – gains on the disposal of EIS shares are exempt. For many investors who are new to a company, these reliefs may be the key additional incentives to invest. The income tax relief reduces the effective cost of the investment. The CGT exemption removes gains from a charge to tax, without limit, on shares that have qualified for income tax relief. Therefore companies wanting to raise finance for a new venture should consider whether the EIS scheme could apply to them. New companies can also consider the junior sister of EIS, the Seed Enterprise Investment Scheme (SEIS). Neither of these tax breaks will be available if the person is ‘connected’ to the company. For example an individual will be connected with the company if he controls more than 30% of the ordinary share capital of the company. If, however, a number of individuals are setting up a new venture, an EIS or SEIS scheme could provide the tax breaks for any of the individuals who hold less than 30% of the shares. Where funds needed to establish the new venture are relatively small, the business owners may consider it is not worth while incurring time and costs to set up an EIS or SEIS scheme. The income tax relief on a small investment may not be considered to be worth the effort. But they should not forget the power of the CGT exemption, which is only available if income tax relief has been claimed on the subscription. Consider the recent tax case of the unfortunate Mr Ames. Mr Ames was a skydiver. He realised that the risks and costs of the sport, together with the British weather, limited the growth of his sport in the UK. He had the idea of teaming up with a small number of other individuals to provide the first UK indoor skydiving simulator. The company applied for share subscriptions to fall within EIS, HMRC agreed and the company issued Mr Ames with the relevant form for him to submit to HMRC. He did not complete the form because, although he had paid £50,000 for his shares in 2005, his income was below the personal allowance for that year and the preceding year. The company prospered and Mr Ames was able to sell his shares for £333,200 in 2011. When he submitted his tax return for the disposal he submitted the EIS form. HMRC accepted that all relevant EIS conditions had been met and said that, had Mr Ames made a claim for EIS income tax relief, no CGT would have been payable on the disposal of the shares. However Mr Ames had not made a claim and was no longer within the time limit. So the capital gain of £283,200 was taxable rather than tax free. The tax tribunal agreed with HMRC. EIS is an excellent tax relief but there are many traps for the unwary, as the case of Mr Ames illustrates. It is absolutely essential to take professional advice before investing.